WHEN DRS wanted Class 37 No. 37401 returned from a loan period at the SRPS Diesel Group it was offered No. 37703 in its place, as the former was being overhauled at the Bo’ness & Kinneil Railway (B&KR). No. 37703 needed attention but was soon returned to working order in 2015, running initially in DRS blue with ‘ Direct Rail Services’ branding on its sides. DRS requested this to be removed so the Type 3 was repainted and re-entered service at the B&KR’s diesel gala on December 29. It is now in BR blue with its original number, 37067. 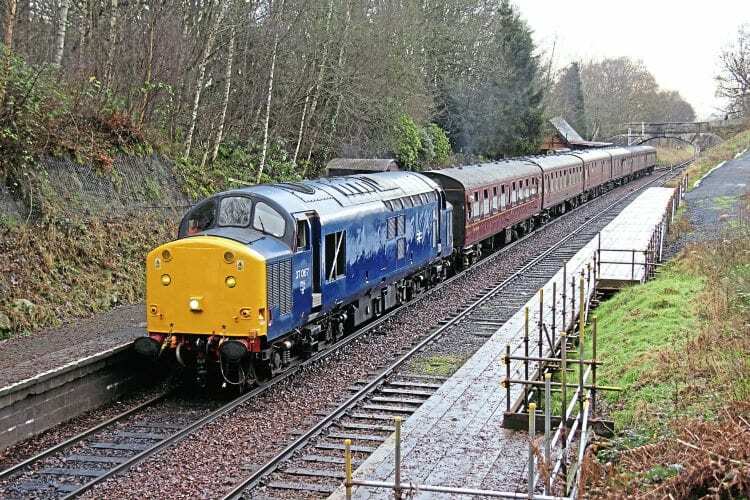 Here, it passes through Birkhill station with the 10.30 Bo’ness-Manuel. It remained on the rear of the return working, headed by visiting loco, Colas Rail Freight’s Class 60 No. 60056.